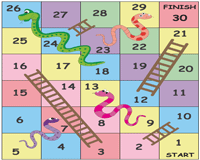 Employ this vast collection of vivid and fun-packed subtraction board games featured on this web page. This set of unique games like Mission to Mars, Subtract-o-poly, Spinner subtraction, and many more are sure to be a hit with young learners! 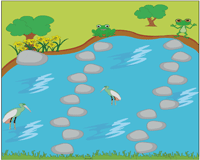 These activity-based worksheets are tailor-made for kindergarten to Grade 3. A fun way for beginners to learn subtraction! 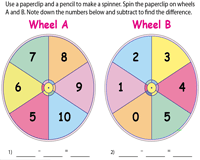 Spin wheels A and B. Record the numbers and subtract them to find the difference. A great interactive game that helps kids quickly pick up skills at subtraction with the roll of dice. Download our theme-based coloring worksheets, instructions, and the subtraction key to get started! A delightful twist to the conventional board game! 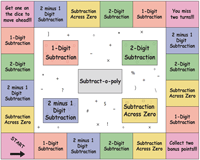 Children will need to subtract (instead of add) the numbers on the roll of dice. Then, move their counters forward based upon the difference arrived at! Boards with varying number of spaces (up to 30/50/100) are at your disposal. Two players get to roll a pair of dice. Subtract the numbers that appeared on a pair of dice. 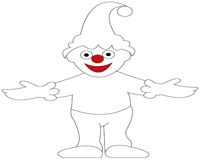 The player who obtains the higher difference will move a step forward. The first player to reach the finish point is the winner. 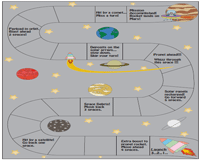 Board game: Mission to Mars! Launch your rocket and embark on a rollercoaster ride to the red planet! Roll the dice, subtract and move your counters in accordance with the difference arrived at. Engage in a battle with the other players to be the first complete the Mission to Mars! Based on the popular monopoly game, this one comes with a 'difference'! Kids will get to enhance their skills at 1-digit subtraction, 2-digit subtraction, 2 minus 1-digit subtraction and subtraction across zeros.